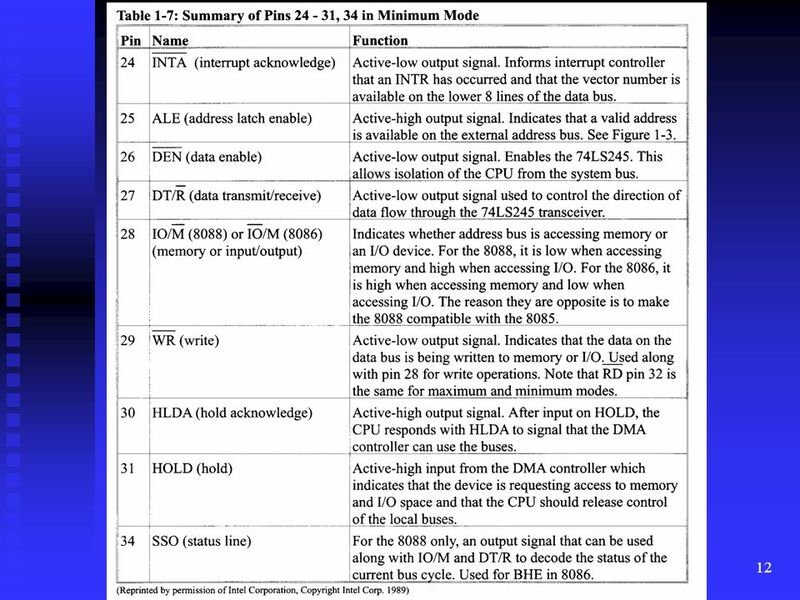 2 PC, terminals for the main frame? 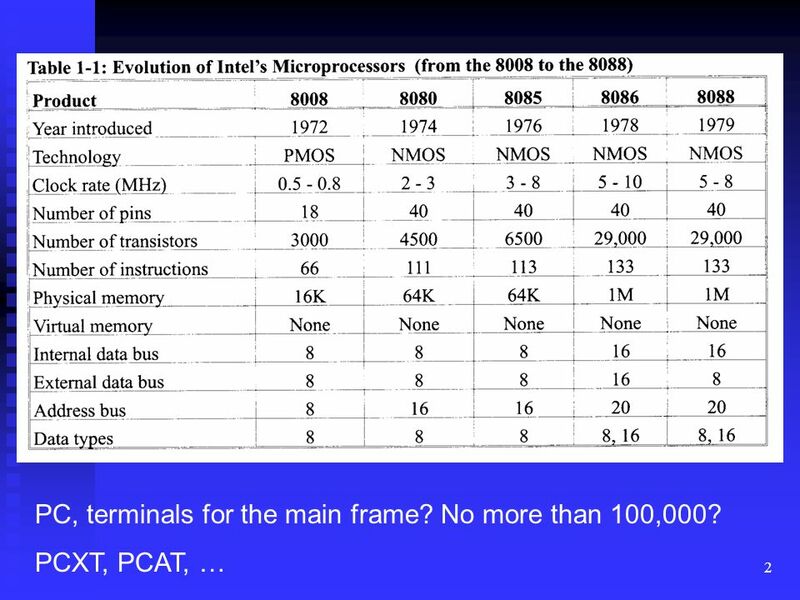 No more than 100,000? 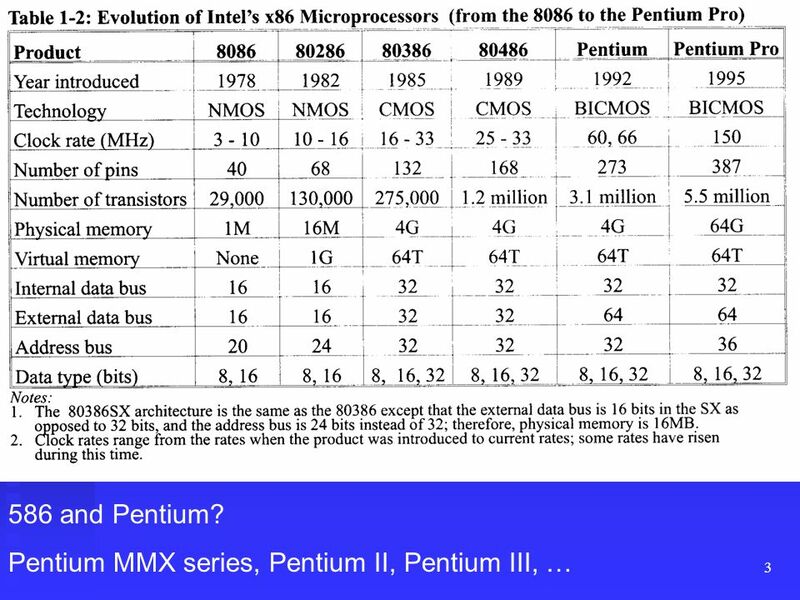 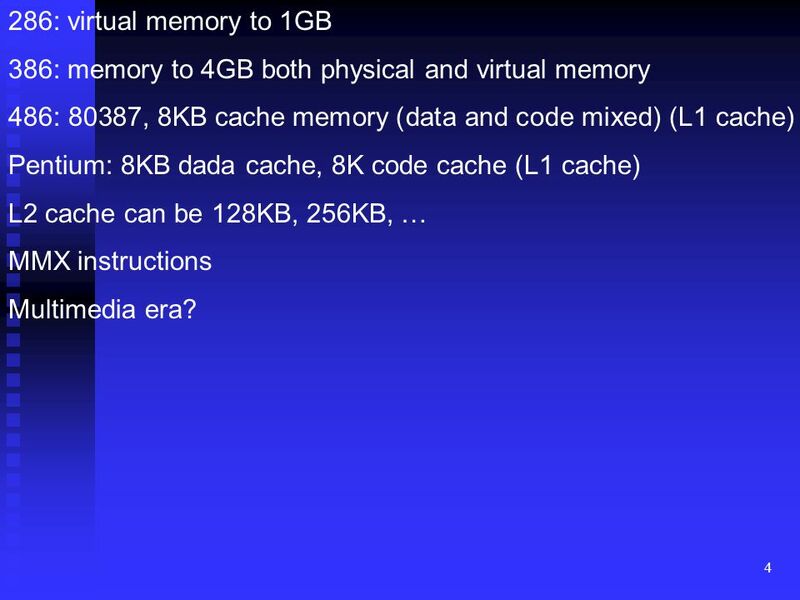 4 286: virtual memory to 1GB 386: memory to 4GB both physical and virtual memory 486: 80387, 8KB cache memory (data and code mixed) (L1 cache) Pentium: 8KB dada cache, 8K code cache (L1 cache) L2 cache can be 128KB, 256KB, … MMX instructions Multimedia era? 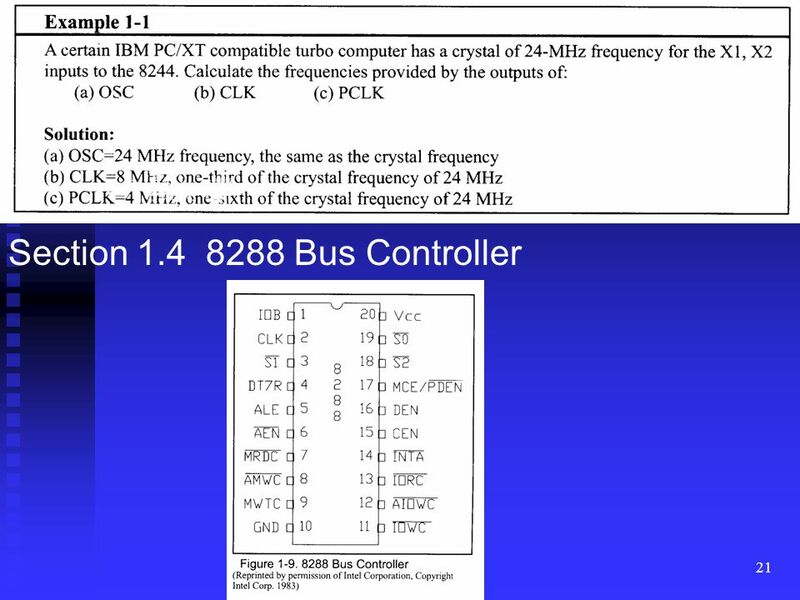 Input pins: RES (reset in) X1 and X2 (crystal in): must be three times the desired frequency. 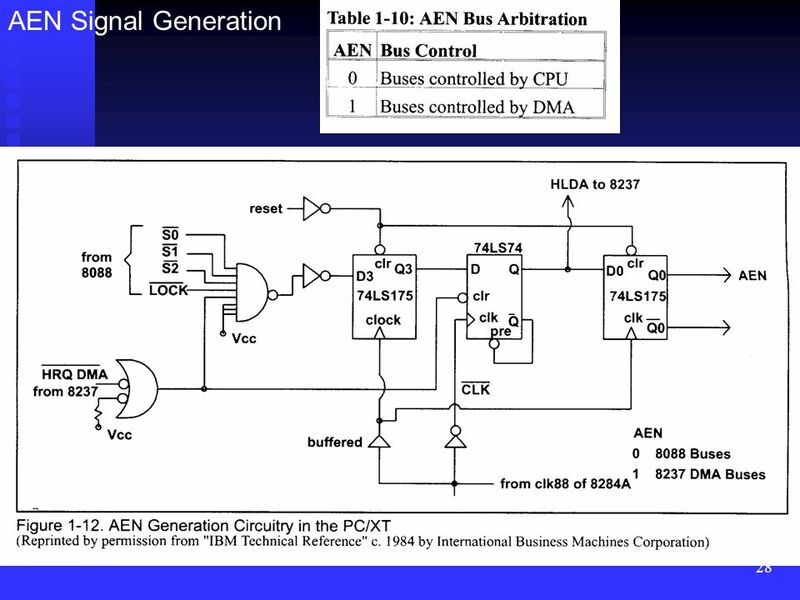 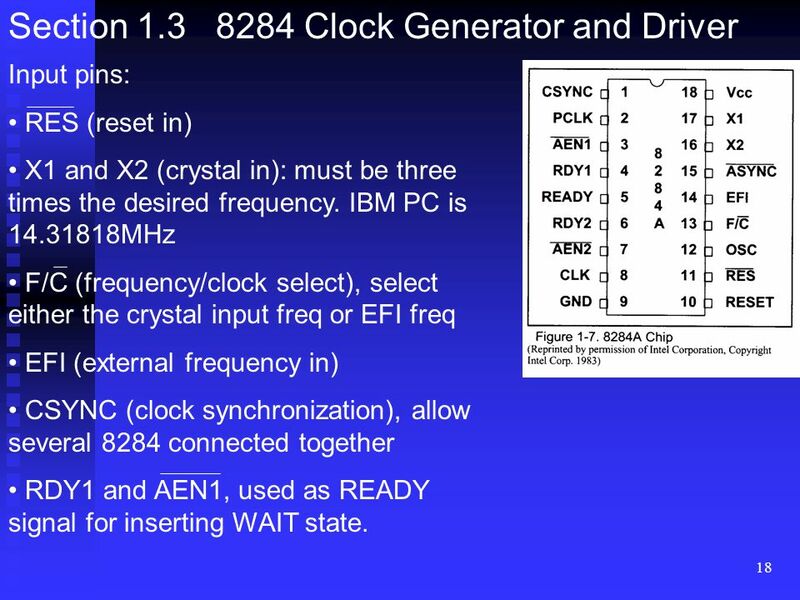 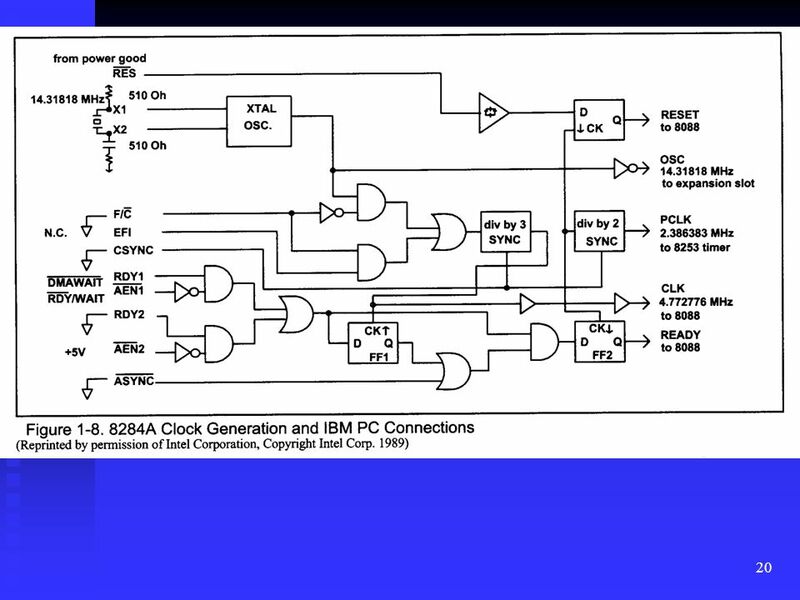 IBM PC is MHz F/C (frequency/clock select), select either the crystal input freq or EFI freq EFI (external frequency in) CSYNC (clock synchronization), allow several 8284 connected together RDY1 and AEN1, used as READY signal for inserting WAIT state. 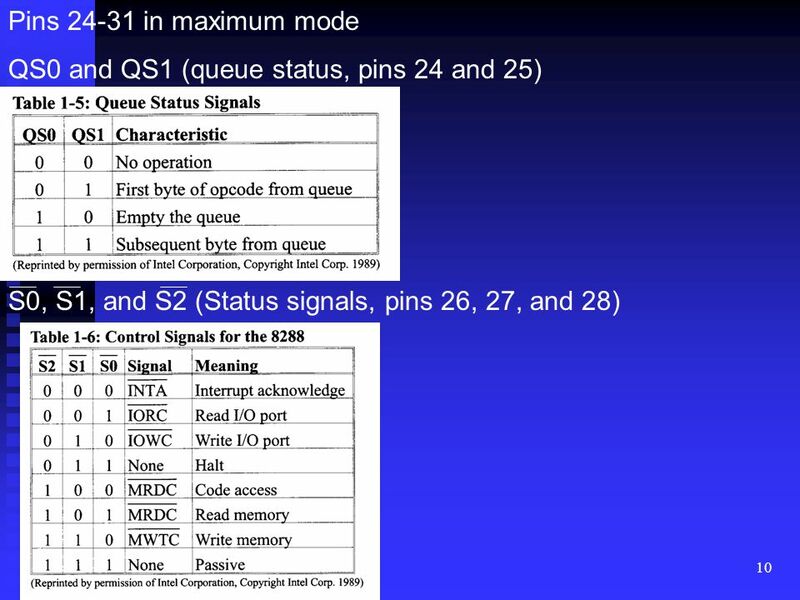 19 RDY2 and AEN2, like RDY1 and AEN1 and are used for multiprocessing system. 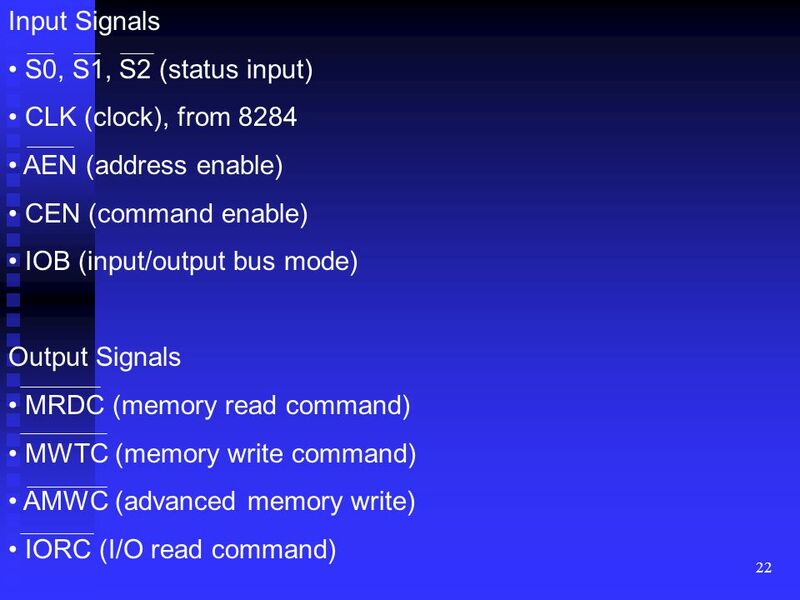 ASYNC Output signals RESET OSC (oscillator), provides the same frequency as the oscillator. 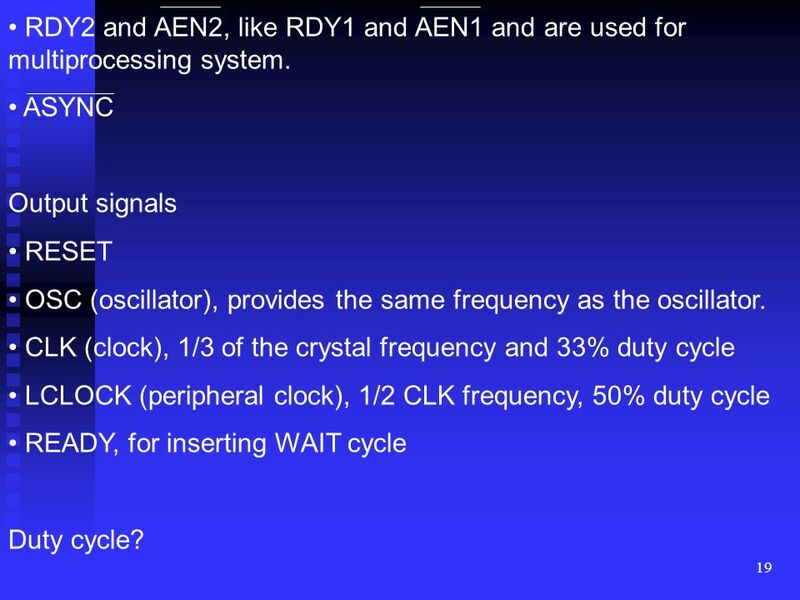 CLK (clock), 1/3 of the crystal frequency and 33% duty cycle LCLOCK (peripheral clock), 1/2 CLK frequency, 50% duty cycle READY, for inserting WAIT cycle Duty cycle? 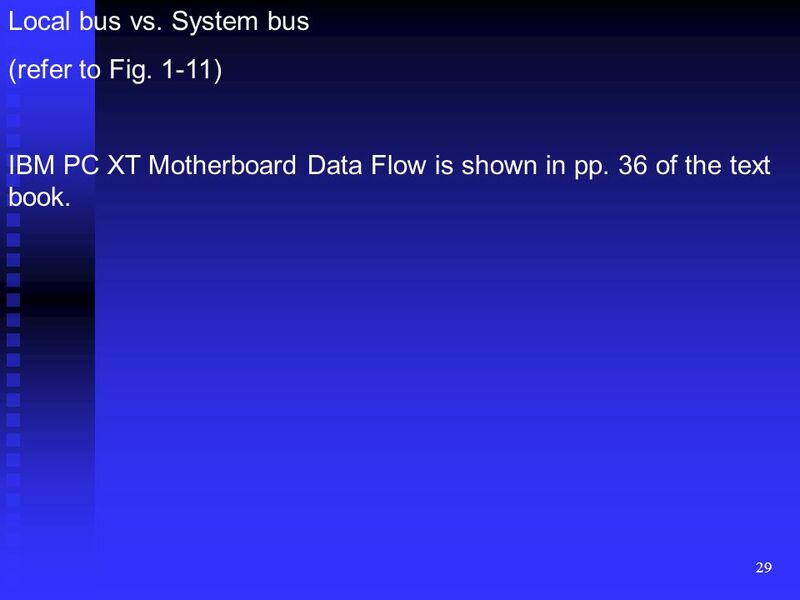 29 Local bus vs. System bus (refer to Fig. 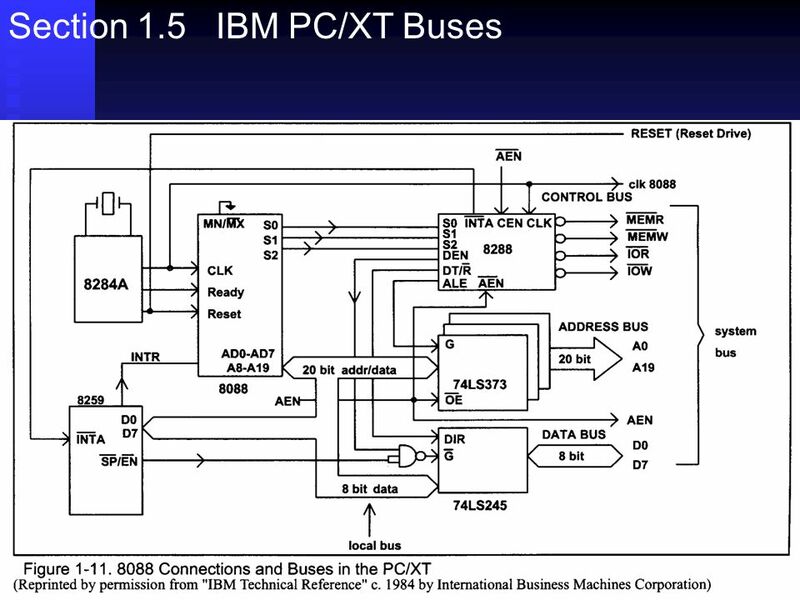 1-11) IBM PC XT Motherboard Data Flow is shown in pp. 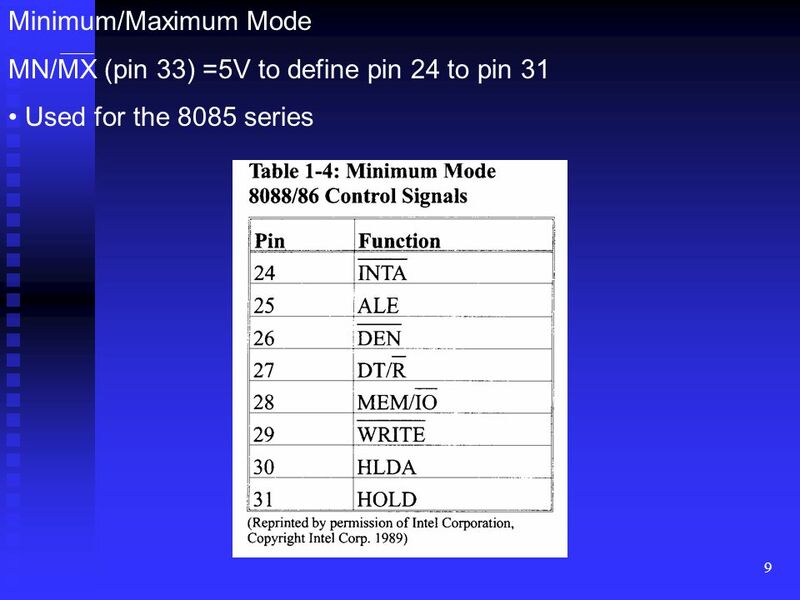 36 of the text book. 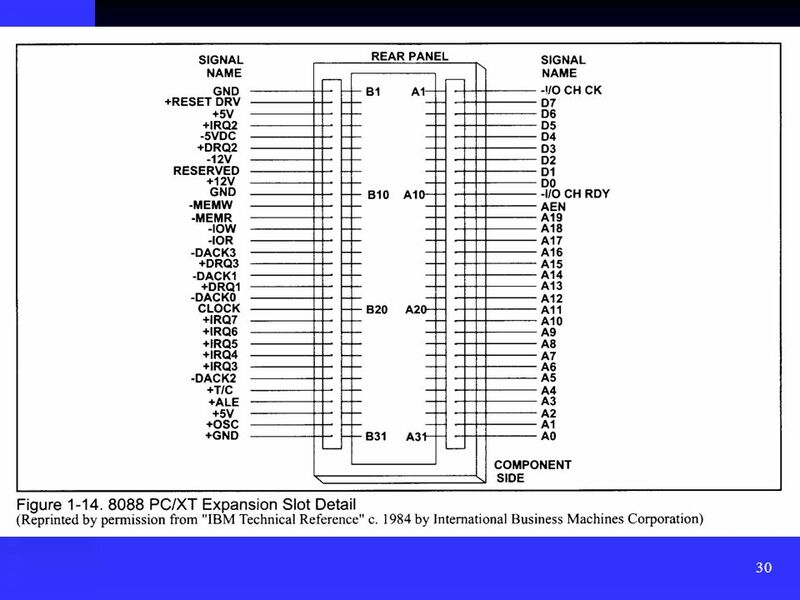 Download ppt "8088/86 Microprocessors and Supporting Chips"
8086  Ahad. 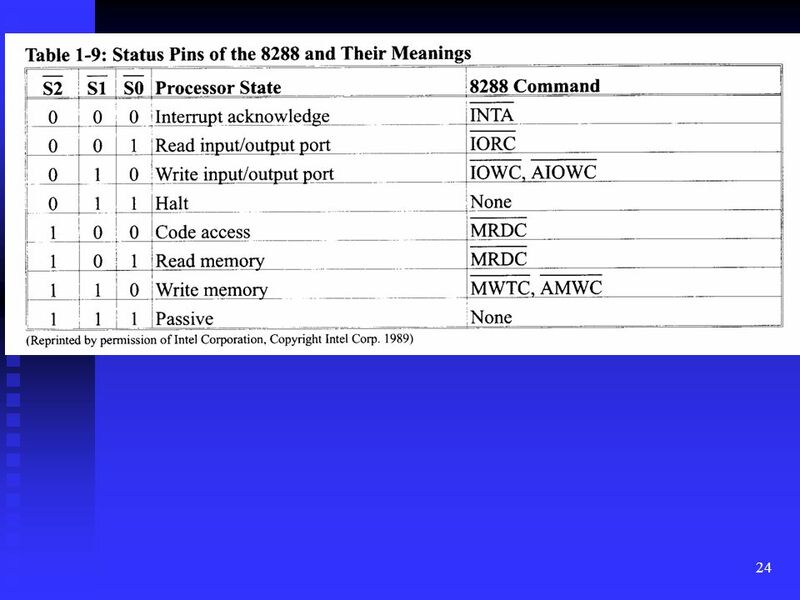 Internal! 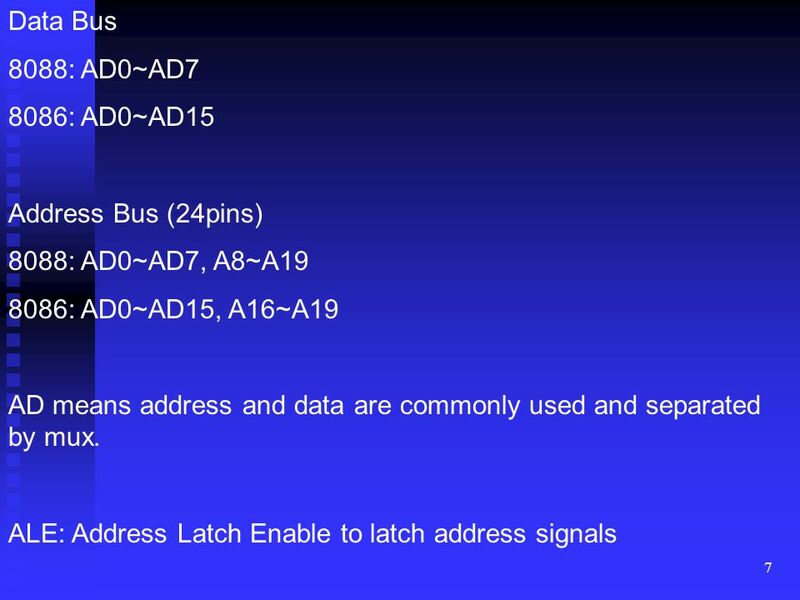 External? 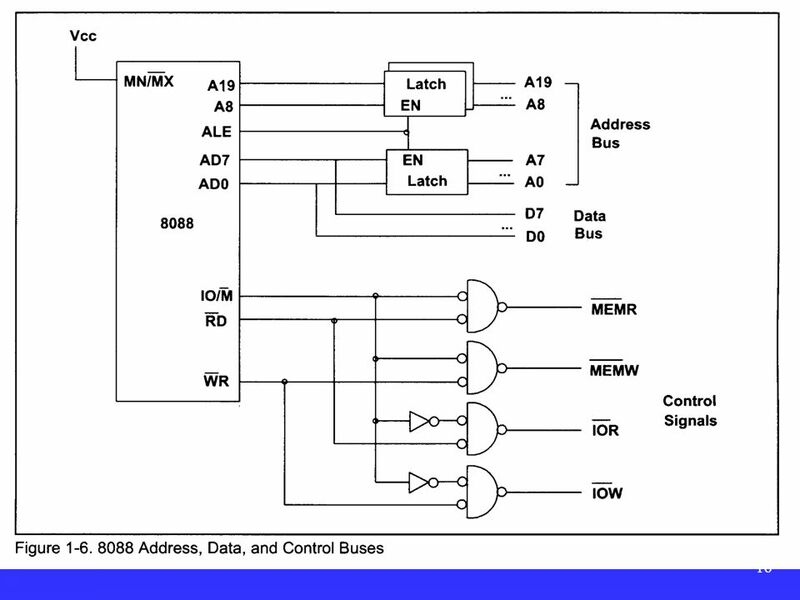 8086 vs _bit Data Bus 20_bit Address 8_bit Data Bus 20_bit Address Only external bus of 8088 is. 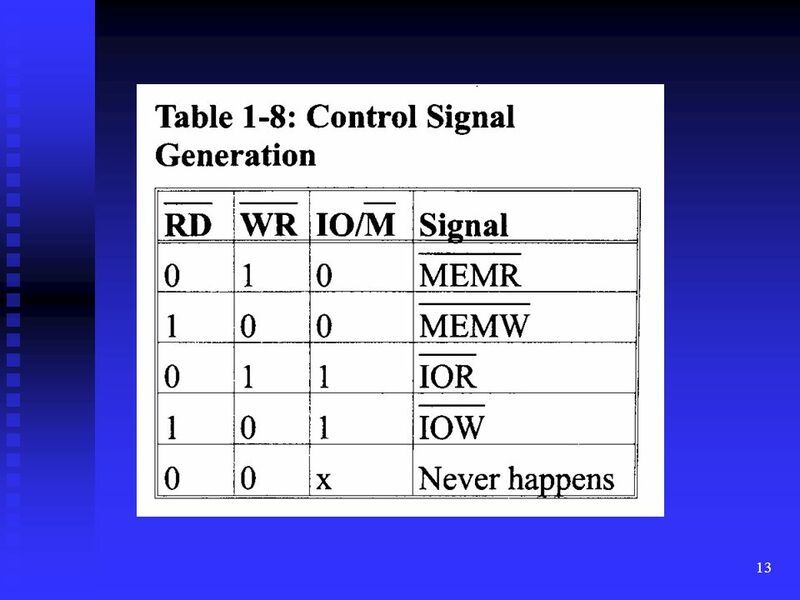 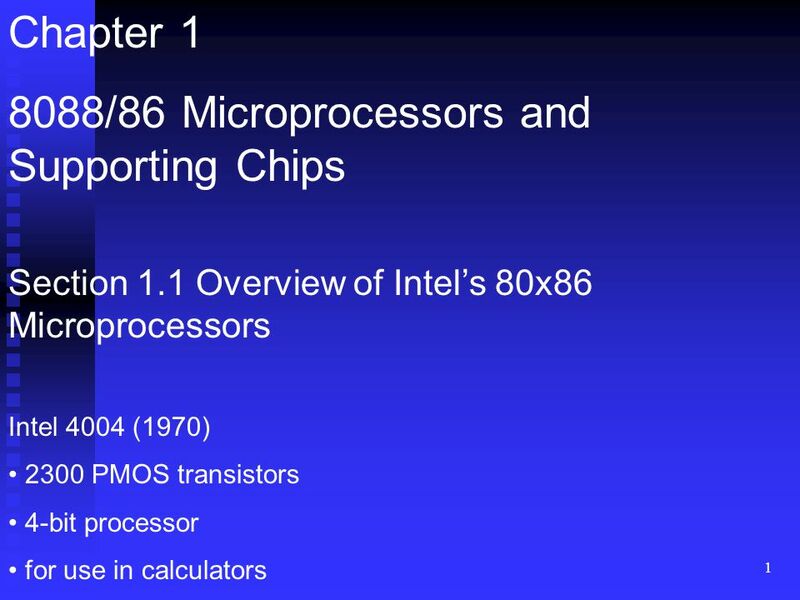 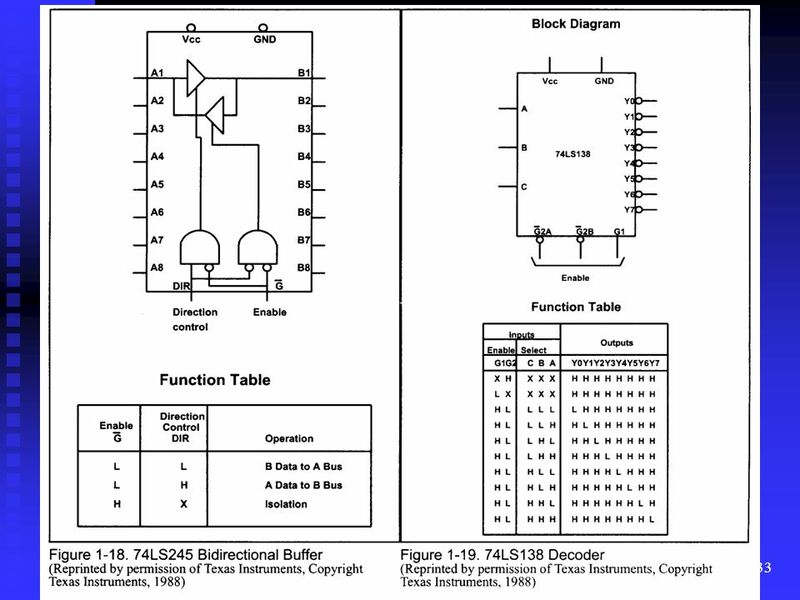 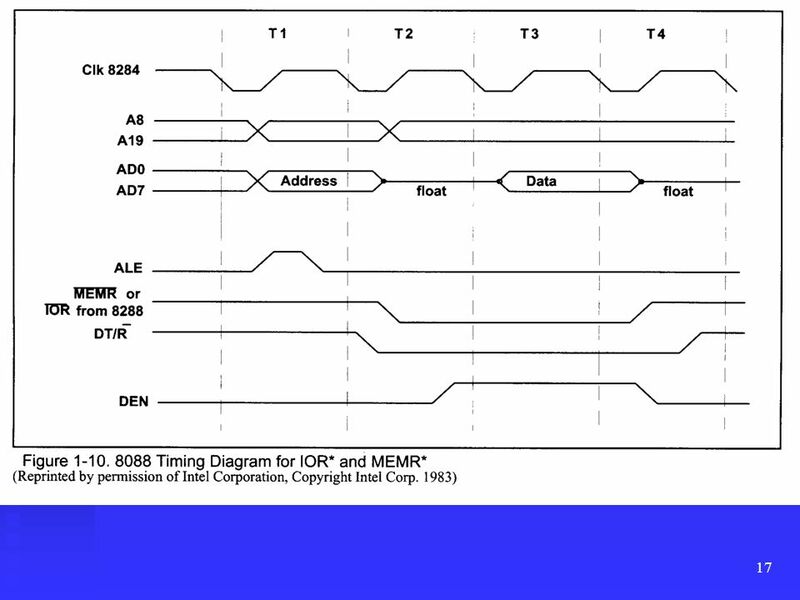 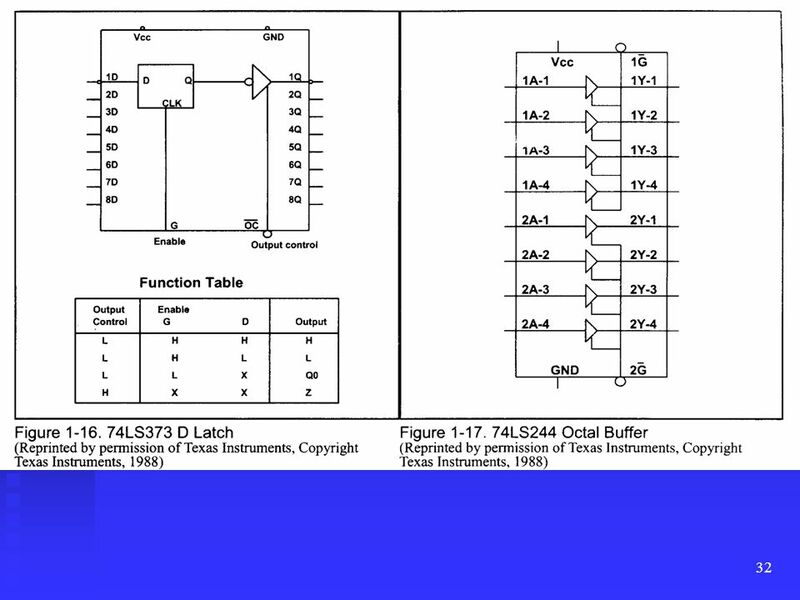 ECE 2211 Microprocessor and Interfacing Chapter 8 The 8088/8086 Microprocessors and their memory and I/O interfaces Br. 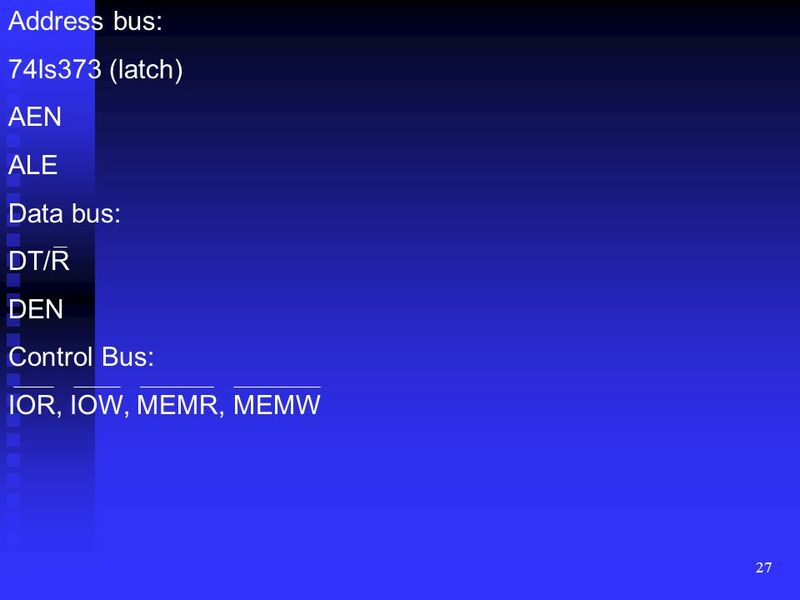 Athaur Rahman Bin Najeeb Room. 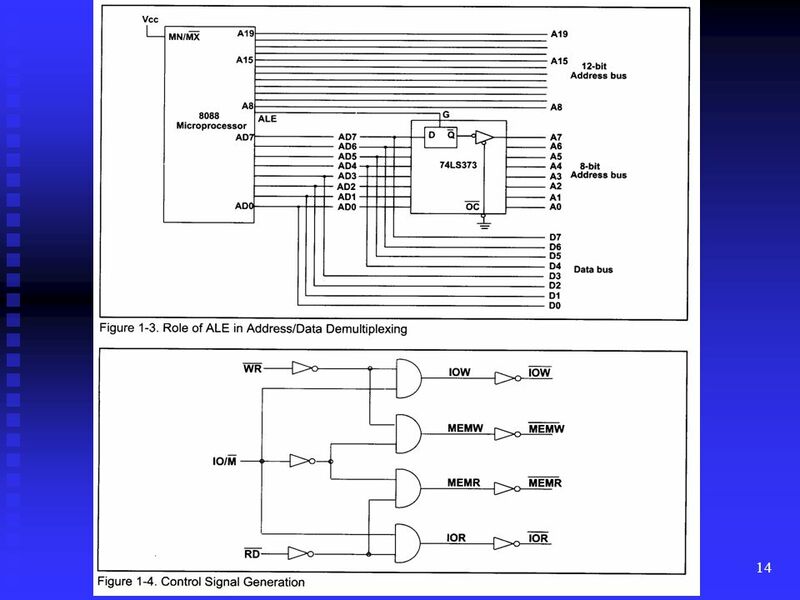 Chapter 13: Direct Memory Access and DMA-Controlled I/O. 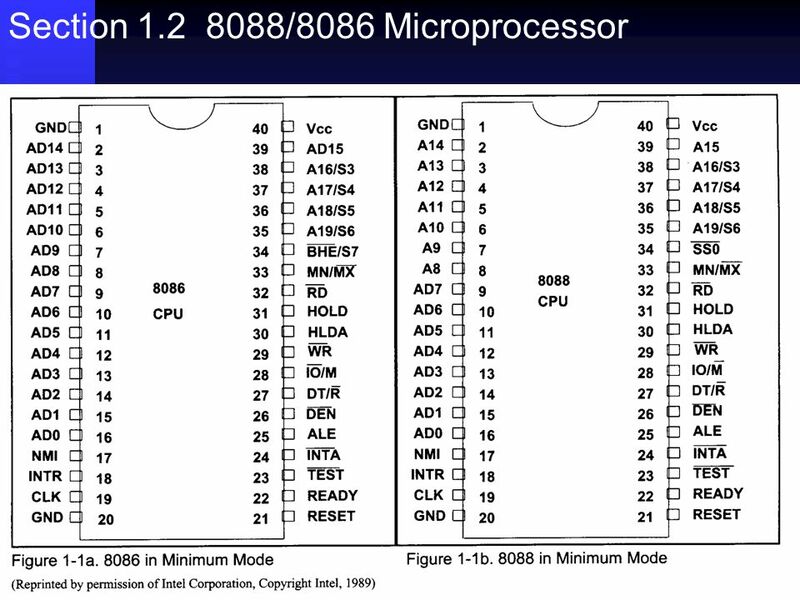 8088 Microprocessor Hardware. 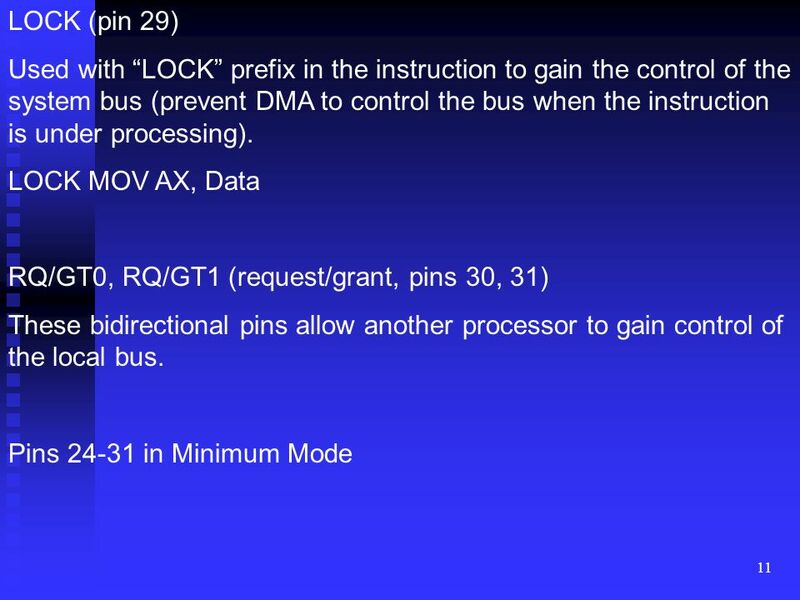 Microprocessor System Modules CPU Memory (RAM, ROM) Peripherals (IO) Data Bus Control Bus Address Bus Keyboard Monitor Printer. 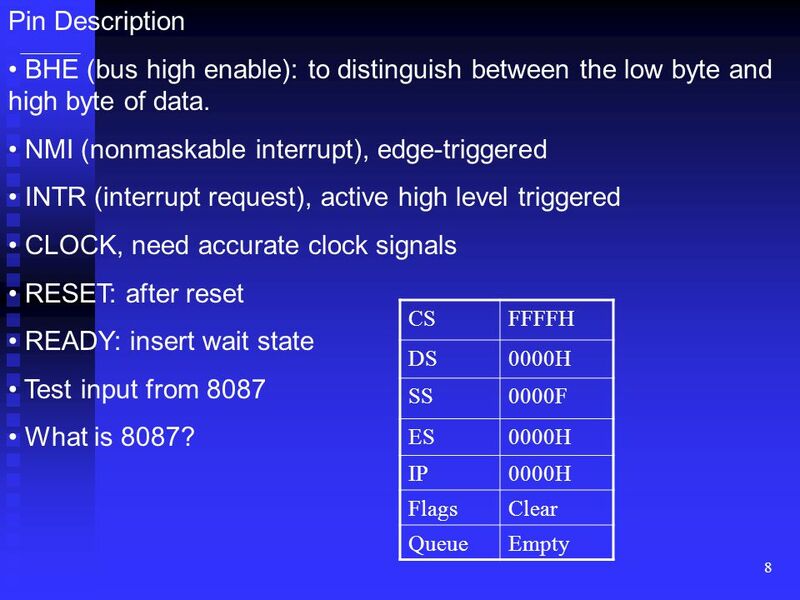 SYSTEM CLOCK Clock (CLK) : input signal which synchronize the internal and external operations of the microprocessor. 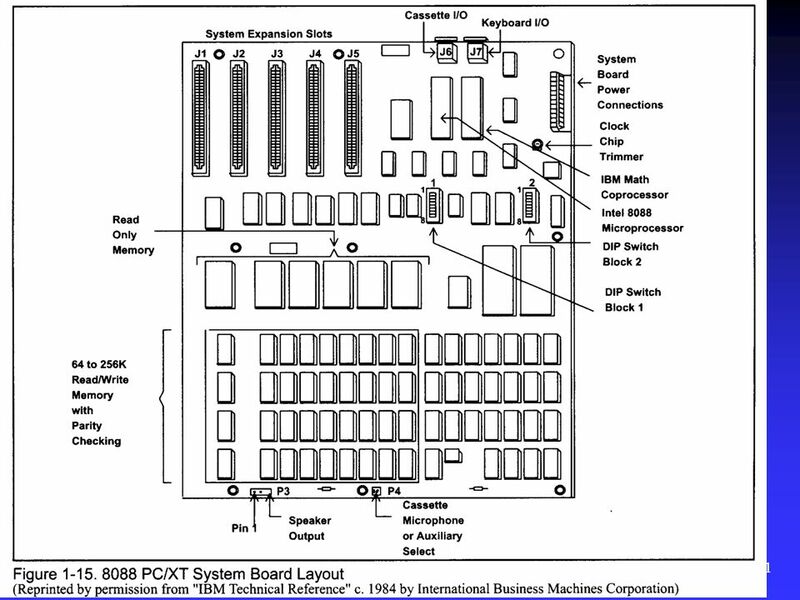 The 8085 Microprocessor Architecture. 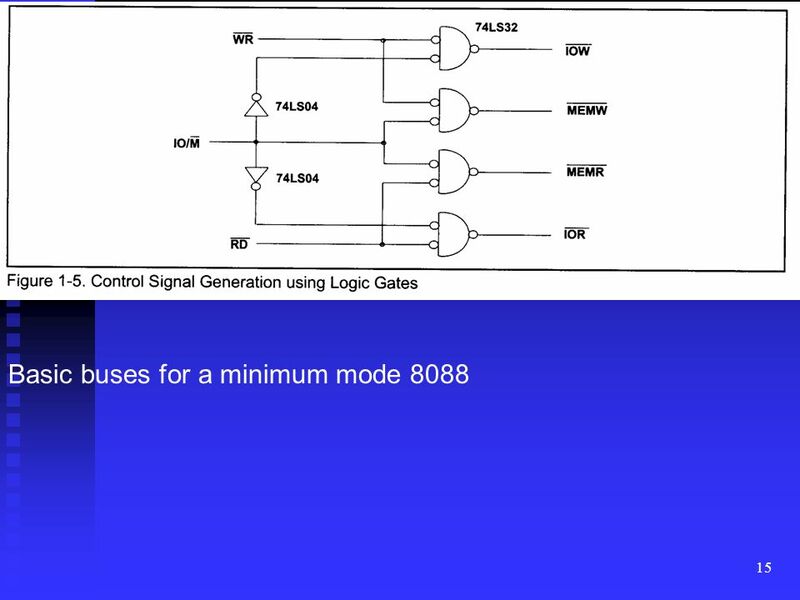 What 8085 meant for? 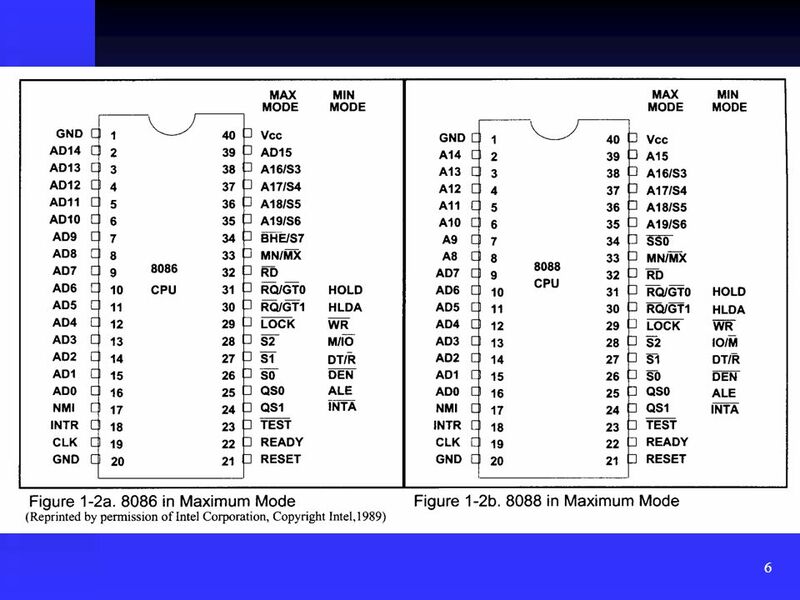 80 - year of invention 8 - 8 bit processor 5 - uses +5V for power.